VTT has become a major source in the field of smart textiles. Shieldex® conductive textiles are becoming the most widely used component in development of smart textiles. As a result, many wearable technology developers are finding the Shieldex® conductive fabrics and yarns provide excellent conductivity which is required to embed sensors especially used in medical and athletic smartwear development. V Technical Textiles, Inc. is pioneering new technology utilizing our Sn/Cu/Ag conductive fabric (Zell) PN#1500101130 or PN#15002001130 to offer a game changing, value added, innovative new product named Etchtex. This ground breaking application of a proprietary process to our conductive textiles is expected to have an exponential effect within its associated industries. 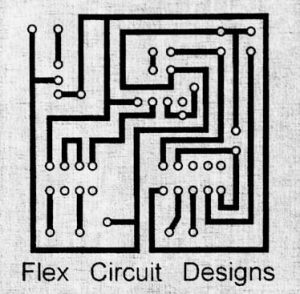 Therefore this application has led to V Technical Textiles ability to offer both standard and custom designed solutions to the capacitance sensor, resistive heating, flexible circuit, smart textile, patch antenna, heated clothing, smart gloves, and wireless communications industries to name a few. Utilizing a proprietary process, V Technical Textiles has worked closely with a third party to develop the ability to selectively remove sections of metal from the conductive fabrics. This process becomes especially relevant to produce specific designs within the body of Sn/Cu/Ag conductive textiles. Therefore this ability allows for the production of both standard and custom designed sensors, resistive heaters, antennas, and other associated flexible lightweight solutions to these industries. While this type of technology is currently being performed on thin film devices, the innovation here is the ability to provide this technology on a textile. In conclusion, this innovation increases the durability and conductivity of the solution versus thin film technologies; and also increases flexibility of design. V Technical Textiles has developed a solution to produce flexible, reliable, and durable interconnection components and methods. Utilizing our TPU wire constructed of silver plated yarns and a TPU overcoat; we have pioneered a solution to replace rigid wires and connections. 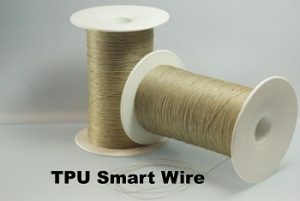 Our TPU wire can be ultrasonically welded to our conductive fabrics, and traditional interface components; eliminating the use of rigid wires and mechanical interconnections.